'Najib left only RM450m for RM11.86b tax refunds' | Daily Express Online, Sabah, Malaysia. 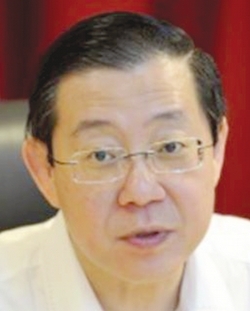 Kuala Lumpur: Finance Minister Lim Guan Eng (pic) said Wednesday that predecessor Datuk Seri Najib Razak left the Treasury with only RM450 million to repay RM11.86 billion owed to taxpayers after the general election. Lim said that as of April 30, the Consolidated Revenue Account held only the stated sum despite the Government already owing the public another 96 per cent more at the end of Dec 2017. "The former Minister of Finance, Datuk Seri Najib Tun Razak, is dishonest for accusing the Pakatan Harapan government of misusing RM42.2 billion as at December 31, 2017 when he left us with only RM450 million on April 30, 2018," Lim said in a statement. All collections by Putrajaya enter a common pool called the Consolidated Account which includes three different accounts maintained by the Accountant- General: the Consolidated Revenue Account, Consolidated Loan Account, and Consolidated Trust Account. Only the funds in the Consolidated Revenue Account can be transferred to the Goods and Services Tax (GST) and Tax Refund Trust Account, which then would be used to reimburse taxpayers. Lim said despite Najib's assertion that there was RM42.2 billion in the Consolidated Account at Dec 31, 2017, only RM11.86 billion was in the Consolidated Revenue Account. Even then, the RM11.86 billion was never transferred to the Tax Refund Trust Account, Lim said. After Pakatan Harapan took over the Federal Government, Lim said, the amount in the unaudited Consolidated Account was just RM35.5 billion while only RM450 million was in the Consolidated Revenue Account. "This shows the Consolidated Revenue Account has deteriorated substantially by RM11.41 billion in just over four months. "Datuk Seri Najib should explain this drastic drop of RM11.41 billion or 96 per cent in the Consolidated Revenue Account since Dec 31, 2017 to April 30, 2018," he added. In comparison, Lim said the PH administration has increased the unaudited Consolidated Account amount to RM59.9 billion as at July 31 this year with RM3.81 billion in the unaudited Consolidated Revenue Account despite the tax holiday starting June 1. "This increase in unaudited Consolidated Revenue Account to RM3.81 billion on July 31, 2018 is an improvement of 8.5 times by Pakatan Harapan as compared to Barisan Nasional as of April 30, 2018. Hence, it is not true that the Pakatan Harapan government has misused the Consolidated Fund inherited from the Barisan Nasional Government as alleged by Datuk Seri Najib," he said.